The MPOA dredging contractor has now completed the dredging of White Oaks Bay, and over the next 3 or 4 days will be re-positioning the dredge and pipeline to allow them to begin dredging near O'Brien Shoals. This means that the pipeline will soon extend across the middle of Wonder Lake, roughly between West Bay and Wonder Center Beach, as shown on the attached PDF exhibit. While the contractor will be installing pipeline markers and pipeline crossings, all lake user's must exercise extreme caution when operating in the mid-section of the lake. as always, no-wake boating is required at all times within close proximity of the dredge, dredge pipeline, and other dredging related equipment. The dredging contractor determined that with the pipeline and equipment currently on the lake, they would not be able to move from White Oaks Bay to Lookout Point, as was originally planned. As a result, the dredging of Lookout Point, which is estimated to take one week, is planned to occur early in the Spring of 2016. 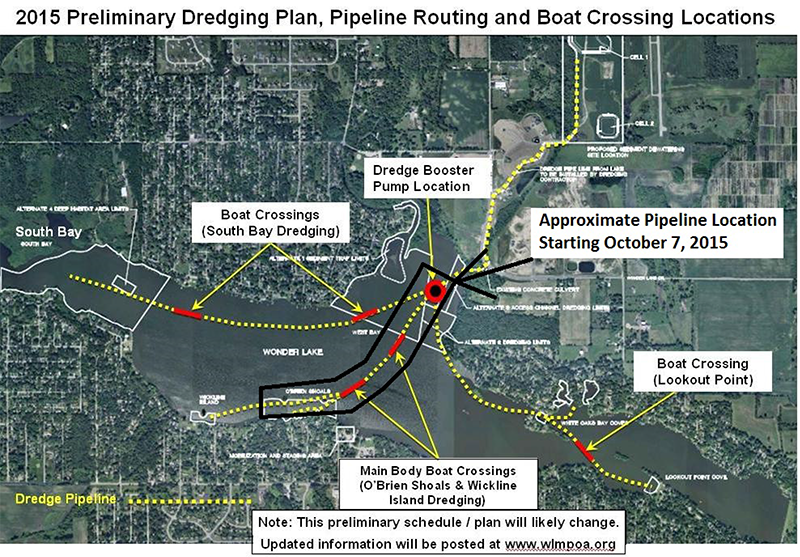 All other areas of the lake slated for dredging under the contract will be dredged, including any remaining sections of West Bay / Nippersink Creek inlet; Wickline Island; and South Bay. It is hoped to have any dredging near shoreline areas completed before the start of the 2016 boating season, to prevent any delays in piers being installed. As the dredging contract payout is based solely on the verified volume of sediment removed, that verification of the volume of sediment removed to date has already begun with a land surveyor, which will be compared against the measurements being taken by the GPS system found on the dredge.